tibet2 -- It took five days of walking to get here but it was worth it. Pethang Ringmo was, for me, the highlight of the Kharta trek though the entire trek was amazing. Here I was at over 17,000 feet, Kangshung glacier on the left, Everest straight ahead and I'm walking on a beautiful green pasture. I did not see any nomads here but they come here to graze their yaks. 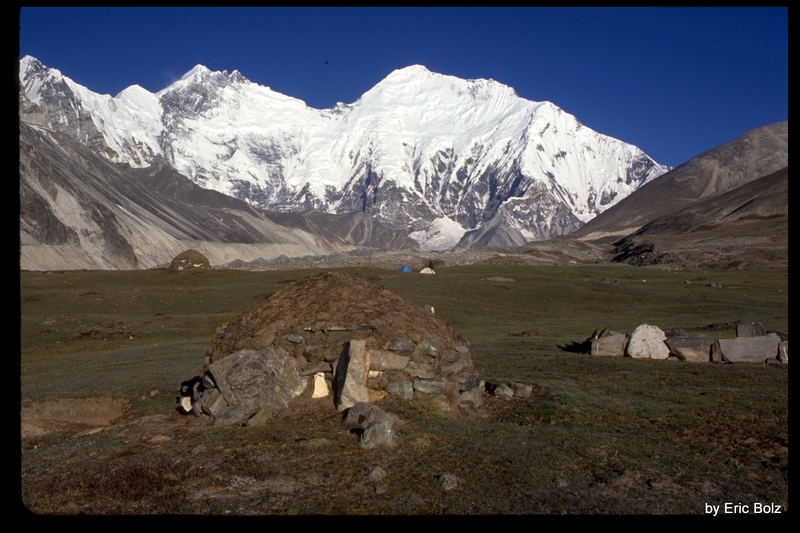 There are several yurts, filled to the brim with dried yak dropping. The sunrise was amazing, this is the east face of Everest so it is the first thing that the sun hits in the morning. But I'm getting ahead of myself, the trek started in Yueba where our driver let us off. If you are considering this trek then there is no reason to begin in Kharta, the road, lousy though it is, is better driven than walked. There are no lodges in Yueba but the people are friendly and will welcome you to pitch a tent anywhere.